James F. Phillips was born in Cambridge, Idaho, in 1900. After graduating high school in Des Moines, Iowa, he received a scholarship to the University of Iowa, from which he graduated in 1922, with a bachelor of science degree in civil engineering. Due to his high scholastic standing, he received an honor appointment as a Regular Army officer in the Corps of Engineers January 5, 1923. Within seven months after joining the Army, General Phillips was rated a distinguished marksman and was a member of the international rifle teams of 1923, 1924 and 1925. His first assignment with the Army was at Fort Humphreys, Virginia, where he graduated from the Engineer School in 1924. He transferred to Fort Dupont, Delaware, and in November 1926, joined the 11th Engineers at Corozal, Panama Canal Zone. In July 1927, General Phillips entered the Air Corps Primary Flying School at Brooks Field, Texas, and then transferred to the Air Corps Advanced Flying School at Kelly Field, Texas, from which he graduated with the ratings pilot and observer in June 1928. He then joined the Seventh Bombardment Group at Rockwell Field, California, and in February 1929, went to Wright Field, Ohio, where he conducted experimental work in aerial mapping and photography. During 1931-1932, he did high altitude and long range photography in Maine and California and in the spring of the following two years taught aerial photography and mapping at Harvard University. General Phillips transferred Feb. 16, 1934, from the Corps of Engineers to the Air Corps. The following July he entered the Air Corps Engineering School at Wright Field, Ohio, from which he graduated in June 1935. During the summer of 1934 and the fall of 1935, he was on detached service on the Air Corps-National Geographic Stratosphere Balloon Flights at Rapid City, South Dakota. Development Station at Edgewood Arsenal, Md. In July 1938, he became station technical inspector and station engineer officer at Kelly Field, Texas. Assistant Chief of Air Staff for Materiel and Supply. General Phillips went to the Philippine Islands in August 1945, as commanding general of the Philippine Air Materiel Area, with station at Nichols Field. He became assistant chief of staff for materiel of the Pacific Air Command at Tokyo, Japan, in September 1946. In March 1947, General Phillips was named assistant chief of the Procurement Group of the Army General Staff. The following December he was appointed Air Force secretary of the Research and Development Board of the Department of Defense. In August 1951, he assumed command of the Air Force Cambridge Research Center, Cambridge, Massachusetts. General Phillips has been awarded the Legion of Merit. He is rated a command pilot and senior aircraft observer. 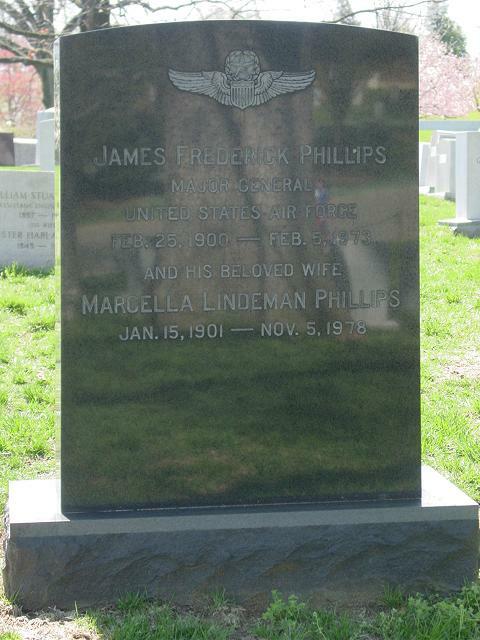 General Phillips was buried with full military honors in Section 5 of Arlington National Cemetery.